The Bulldogs chased the game early, finding themselves in a 1-0 hole just 1:15 into the game when John Hawthorne played a dump-in to the near corner, but couldn't seal his post short-side as Nicholas Poisson put a quick shot on net from the left wing wall that snuck home short-side for an un-assisted marker. The Bulldogs struggled to find their game through the first ten minutes, unable to generate a shot on net. They wouldn't get a true shot on goal until the final five minutes of the period, as Spruce Kings netminder Logan Neaton misplayed a dump in to the slot that Isaac Tonkin-Palmer backhanded on goal. Neither team would generate much in the way of offense throughout the remainder of the period, with the shots being 7-2 Prince George after 20 minutes. The Bulldogs doubled their shots on goal in the first two minutes of the second, and had another great chance when Mackenzie Wight beat Neaton but hit the post as it stayed out. John Hawthorne would make two big saves later in the period, the first being on Patrick Cozzi on a give-and-go with Ben Brar on an odd-man rush. Later, Keaton Mastrodonato hustled hard to chase down a puck in the Spruce Kings zone and drew a penalty after being high-sticked. Hawthorne would make a big shorthanded in alone save on an end-to-end rush by Dustin Manz. Later in the power play, the Bulldogs won a long battle in the Spruce Kings zone that saw Jackson Doucet dig it free in close quarters for Mitchel Deelstra, who rimmed it back to the left point for Darren Rizzolo. He would walk to the middle before putting a wrist shot on goal through traffic that hit a Spruce King stick before finding its way past Neaton to make it 1-1 at 10:00 of the second. Tempers flared seconds later, when Grayson Valente was hit from behind by Michael Conlin. Stephen Castagna would come to his defence, and won a spirited scrap with Conlin. Hawthorne would make another big save late in the period, with his left toe on a spinning one-timer from the slot by Ben Brar seconds after the Bulldogs had killed off a penalty. The Bulldogs pushed and had a series of good opportunities late in the period, with Logan Neaton scrambling to get a blocker on a Dawson Tritt shot from in tight. Shots in the period were 14-7 Spruce Kings for a 21-9 advantage after 40 minutes. The third period was played at a high pace, with each team having their opportunities, with the Bulldogs the better of them before and after a power play chance as Logan Neaton made in-tight saves on both Dawson Tritt and Jackson Doucet to keep it 1-1 through the middle of the period. 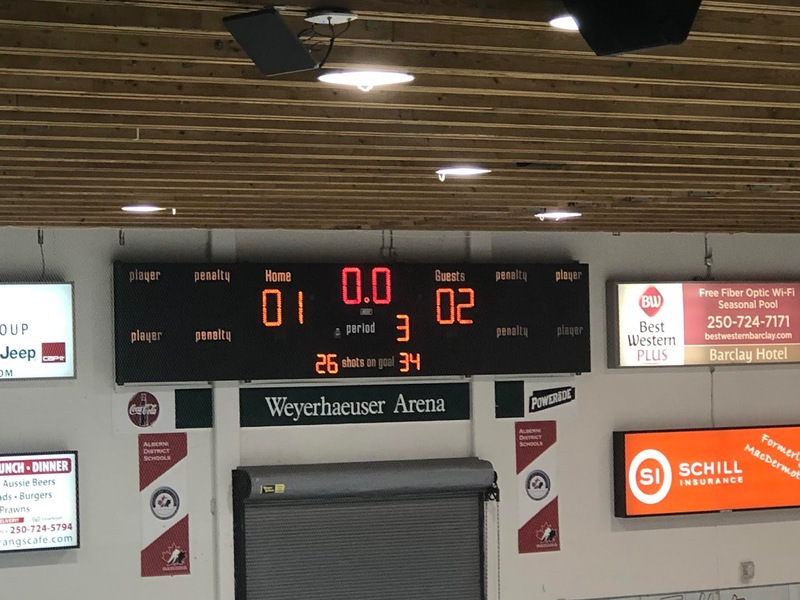 The score stayed that way into the late stages of the third, when the Bulldogs were penalized for interference on a hit on a dump in at centre ice. The Spruce Kings would work the puck around the Bulldogs zone for over 90 seconds without a whistle with a handful of great saves and near misses ending with Ben Brar taking a cross-ice pass in the right circle in tight where he walked in and snapped it home to make it 2-1, with assists going to Nick Bochen and Patrick Cozzi with just 3:56 to play in the third. The Bulldogs would be awarded a power play late in the game, and came painfully close on a number of occasions in tight but couldn't get a bounce on a rebound to beat Neaton for the equalizer as the Spruce Kings killed it off and held on until the final seconds to make the lead stand. Shots in the third were 17-13 Bulldogs, for a game total of 34-26 Spruce Kings with Logan Neaton earning the win while John Hawthorne earned 1st star honours while taking the loss. Both teams went 1 for 3 on the power play. The Bulldogs are next in action tomorrow when they host the Chilliwack Chiefs.